This past Monday, Will and his wife Danika were going to drive down from Albany and pick me up at 7 AM for a birding expedition to Long Island’s barrier beaches, hoping to find a variety of migrants. Their car’s tire had other ideas, however, so I was awake at 6:15 in the morning, jonesin’ for birds, and, after a text message from Will letting me know the bad news, suddenly without plans. Fortunately, I had been reading on the listservs about a Connecticut Warbler hanging out in the Pinetum in Central Park for, oh, nine straight days, so I figured I would check and see if it was still around. Supposedly, the bird was giving stupendous looks, walking through the grass right past people as if they weren’t standing there with mouths agape, binoculars hanging useless on their chests, the bird to close to focus on at such close range. Unbelievably, the Connecticut Warbler was present for the tenth straight day, and, as advertised, it was willing to be seen. In fact, in the above picture, the bird was only a bit more than a meter from me. It was absolutely amazing to watch the bird walk through the grass, foraging for food, completely oblivious to the five birders who had gathered to watch it. It’s cooperation more than made up for the tense twenty minutes or so that I spent unsuccessfully searching. No birder should have to go through a life of birding without looks like this at a Connecticut Warbler. 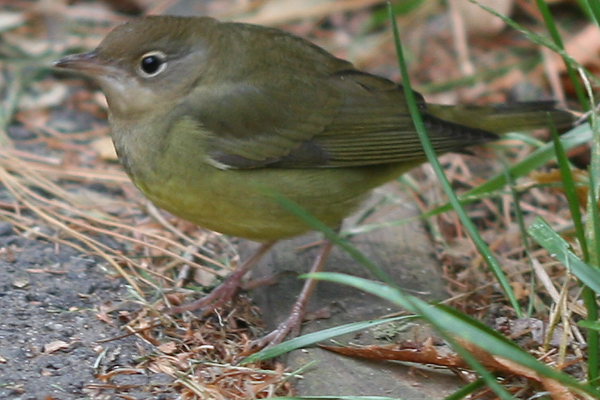 Of course, most birders have never seen a Connecticut Warbler, but, well, I mean come on! This is supposed to be a secretive species and this bird was more in the open than some starlings! It was so obliging I spent over half-an-hour watching the bird walking around in the grass, getting chased by a dog, picking up an shaking a leaf, and, well, being a Connecticut Warbler. After enjoying the looks I actually walked away from the bird. Let me repeat that…I actually walked away from a Connecticut Warbler! But, of course, I wasn’t happy with sighting just one new wood-warbler for the year in mid-October. The Orange-crowned Warbler that had been reported the day before way up in the Wildflower Meadow in the northern part of Central Park was calling to me so that is where I went. And, because it was that kind of day, within five minutes of arriving at the Wildflower Meadow the bird was there, foraging on goldenrod. I could not get as close to the Orange-crowned Warbler as I could to the Connecticut Warbler but it was still great fun watching it fly to a new goldenrod and ride the plant as it bent under the bird’s weight. After already having seen 31 species of wood-warbler this year in New York I had not expected to add two more in one day! But man was it cool to do so! Soon a couple of other birders joined me in watching the orange-crowned (names elude me, which is sad because they were friendly and good birders), and informed me that they had heard a large flock of Pine Siskins flying over a bit earlier. It didn’t take long for the flock of fifty plus birds to show up, circle around overhead, and land high up in an elm (once I got home and got online I learned that this flock was part of a huge push of siskins that has inundated the northeast). Other birds at the meadow included lots of Ruby-crowned Kinglets, Dark-eyed Juncos, scads of White-throated Sparrows, and a lingering Ruby-throated Hummingbird. It’s not everyday that one sees juncos and siskins, which are winter visitors to New York City, and a hummingbird! From the wildflower meadow I ambled over to the grassy knoll, a small hill north of the playing fields in the north end of the park where sparrows often gather, and sat myself down for a snack and some passive birding. Watching Yellow-rumped and Palm Warblers foraging was a treat, as was seeing more juncos, some Chipping Sparrows, and single rather dull Pine Warbler foraging in, of all things, a small pine tree. I also spotted a Brown Creeper making its way up the side of a tree, a couple of mockingbirds, and a bunch of migrating Monarch Butterflies feeding in some fenced-off plantings. After finishing my snack and sating myself on the birds I could see, I ran into Patricia Pollock, a regular Central Park birder, and we went off in search of some more birds. Our best shot at seeing some good sparrows was destroyed when we came upon a large mixed flock of sparrows foraging on a hilltop that were quickly flushed by a hungry Cooper’s Hawk that made a quick pass at the birds, scattering and scaring them, but not snacking on them (he somehow missed). After an hour or so of birding with Patricia, who is a fun person to search for birds with, we parted ways: I was heading south back through the park and she was off for her fourth attempt at spotting the Orange-crowned Warbler). I didn’t add many new birds on my way back through the park. Sure, a pile of Ruddy Ducks were on the reservoir, as were three Pied-billed Grebes, but I was tired and hungry and the hot-dog vendors’ fare just wasn’t enough to sate my appetite. So I headed on out of the park, pausing to watch one of a large flock of Common Grackles trying, unsuccessfully, to crack open an acorn. I also stopped back at the Pinetum to see a horde o’ birders trying to track down the Connecticut Warbler. It had apparently gone into hiding. I tried to help find it for awhile but the bird was nowhere to be seen. I will admit to going on at what might by some considered to be great length about the great sightings I had enjoyed earlier (and I almost needed a helicopter to make my escape from the birders who, as I expounded about how close the skulker had come and how gorgeous it was, got a murderous glint in their eyes). But the six hours I spent birding were wonderful! I saw fifty-eight species total, two of them new for my Anti-Global Warming Big Year (can you guess which two?). It was a happy subway ride home, I can assure you of that! *Pete Dunne’s coinage, in his Essential Field Guide Companion. Two springs ago we had a Connecticut Warbler singing wildly in our backyard, right in the city of Rockford… I agree that every birder should get wicked looks at this fantastic bird. Great shots of the fall migrants. My Connecticut Warbler sighting this year lasted all of about 1.78621 seconds, so you can bet I’m quite jealous of your time with this bird! 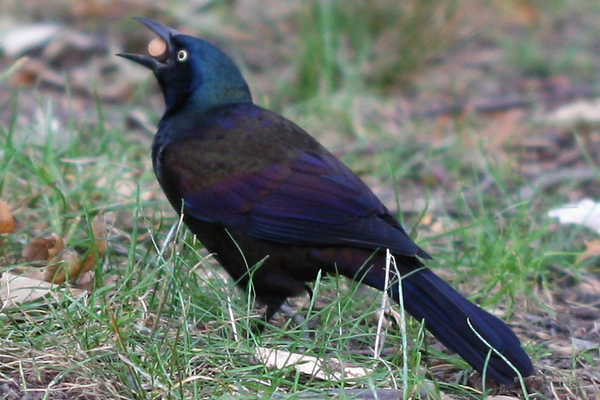 Aggravating and noisy they may be, but grackles sure do look nice when you can see that irridescent sheen of theirs. Great shots all around, Corey! Drat, Drat, Drat, Drat, Drat, Drat, Drat, Drat, Drat! @Christopher: It was absolutely wonderful…I still can’t believe how cooperative the bird was. @Kyle: I too am a big fan of grackles. And thanks! A bird flew into my living room in Brooklyn last night at 10:30 at night. At first I thought it was a sparrow–just a small brownish flapping mess. Poor thing was scared and kept flying into walls etc. He/she ended up in my tiny kitchen and came to rest a few times before I was able to open the second kitchen window and he found the exit. 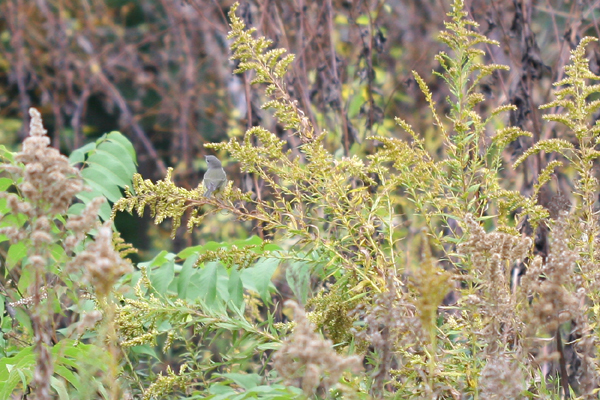 It wasn’t a sparrow, though–slightly smaller, with a narrower beak, and a greenish rump…I was looking for pictures on Google to try and ID it and your Connecticut warbler pix above looks like the guy I saw. Is this possible? Do these birds fly around at 10:30 at night? THe poor guy did seem confused. @Maggie: Wood-warblers (and many other birds) migrate at night, so it is possible, but just because of the relative rarity of the Connecticut Warbler it is more likely that your bird is one of the similar wood-warblers.